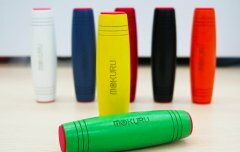 Loving Life with Little Ones: MOKURU stick- the new fidget toy? Hands up if you like to keep your fingers busy or if your child has a fidget spinner, well fidget spinners are so over... we have a new fidget toy in our house- the MOKURU stick and it is pretty addictive. We have been testing the MOKURU stick in our house over the last week and I have to say that it is a bit addictive. The craze is big in Japan and the toy is being released in the UK, exclusively by Peterkin, today and is available at Smyths toy superstore and on Amazon too. On first receiving our package (not knowing what the MOKURU was) and opening it to find a green wooden stick, my first impressions were along the lines of 'uh, what does it do exactly?' Not the best first impression I have to admit, but after a minute I had worked out I needed to flip it and very soon the girls were fighting over who got to play with it first and after a short while we were all trying to do tricks with it too. The MOKURU stick is hand held wooden toy originally designed to test an individual's balance and focus. Claimed to help improve concentration, imagination and alleviate stress- now the simple design has fast fingered flippers hooked, learning and developing tricks with theirs. The MOKURU is a smooth handcrafted beech wooden stick about 4 inches long and tapered at each end with a rubber bit. It comfortably fits in a grown ups hand and is fairly light too, easy to carry in a pocket or purse. A go anywhere toy for adults and children alike in the playground, on a desk or even at the bar. It is being hailed, after becoming a huge hit in Japan and Hong Kong, as the next craze. You can hold it in the palm of your hand, roll it and handle it, you can roll it around the desk or solid surface but it comes into its own (and is actually really fun) when you try and flick it! Stand it on one end and knock it over to see it flip itself over and over lengthways across the floor or table, there is a knack to how hard to flick it but once you have worked it out you are off (and so is the stick). From there you can learn many tricks to do with it, try and catch it mid flip, flip and balance it on your hand, flip it in a square or triangle shape and a whole lot more. The girls sat on the wooden kitchen floor knocking the MOKARU to each other giggling as it veered off course and wobbled all over the place causing them endless entertainment. Then I had a go with it one evening and spent ages trying to catch it mid flip as we worked out all the things that we could do with it. I have to say I quite like the MOKARU as a desk toy and it can get quite addictive however it does need a bit of room to move freely and it must be a flat smooth surface such as a floor or your desk to work at it's best. It can also be a little bit noisy as it is made of wood and after a while the repeated sound of the girls clattering it around on the kitchen floor did annoy me a bit. It is great at keeping the Little Ones entertained and Daddy has taken it to work to stop him biting his nails when he is at his desk, it certainly does keep your hands busy and it is really is addictive trying to get the tricks and flips right (we are still trying!). There are quite a few fakes available but as the MOKURU stick has been designed and engineered to ensure perfect balance and is made with the best quality materials, only a genuine original MOKURU will perform the best tricks and flips. Find MOKURU on Facebook, on twitter with the hashtag #mokuru and on Instagram. N.B We were gifted a MOKARU stick in return for this post.